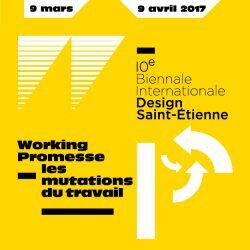 The 10th edition of the Saint-Etienne International Design Biennial will take place from 9 March to 9 April 2017. As in previous years, it will be held at the Cité du Design in Saint-Etienne. The 2017 edition will be devoted to “Working progress: shifting work paradigms”. -the emergence of digital labor and the key role that information technology now plays in the workplace. -new forms of work organization, illustrated by the rise of innovative work environments such as Fablabs and coworking spaces. Through these themes, the Biennial will explore the resulting socioeconomic transformations from a design perspective. The tenth edition of the Biennial remains rooted in its original aim: promoting design among the masses. The last edition drew over 210,000 visitors, including nearly 45% from other regions of France and abroad. The Biennial helps to strengthen the international reputation of the Metropole de Saint-Etienne, which joined the UNESCO Creative Cities network in 2010. This year’s edition of the event will host delegations from 16 design cities around the world. The city of Saint-Etienne has put design at the heart of its development with two pillars, the Ecole Supérieure d’Art et Design (Higher Institute for Art and Design) founded in 1803 and the Cité du Design, created in 2006. The Saint-Etienne metropolitan area joined Aderly in 2015, a testimony to its dynamism and quest to continue its economic growth with the Lyon area and the world. More information about business events in the Lyon region, contact us !